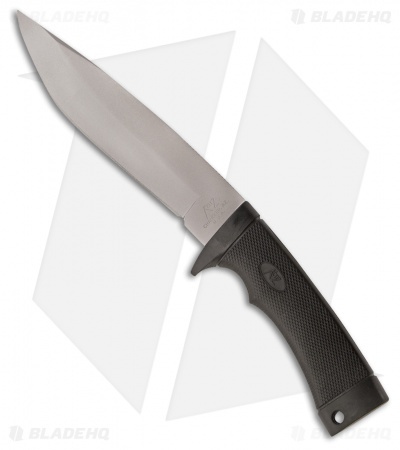 The Katz Knives Black Kat 302 fixed blade knife features a 6.125" hollow ground drop point blade and black Kraton handle. Perfect for any hunting trip, the canted blade and ergonomic handle allow for prolonged use with little to no fatigue. The 6.125" XT-70 stainless steel blade with high hollow grind and satin finish, makes slicing and skinning a breeze. The checkered Kraton handle provides excellent traction, combined with a generous finger groove and handle guard, you can feel confident with the Black Kat in hand. Includes black cordura sheath for easy carry or storage. 6.125" XT-70 stainless steel drop point, hollow ground blade for excellent piercing and slicing capabilities. Black cordura sheath for a variety of carry options.